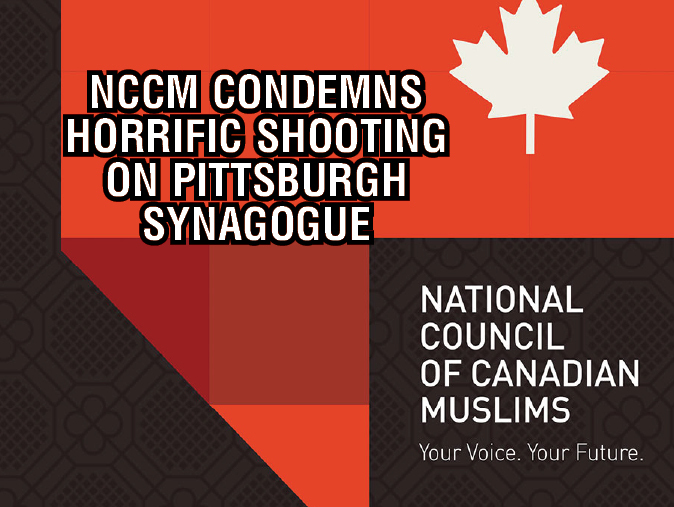 (Ottawa - October 27, 2018) The National Council of Canadian Muslims (NCCM) categorically denounces today's devastating attack on the Tree of Life synagogue in Pittsburgh, Pennsylvania that claimed the lives of several Jewish worshippers. Law enforcement in the United States have said the incident is being investigated as a hate crime, with many noting this may be the deadliest anti-semitic attack in the country’s history. “With heavy hearts, we extend our deepest condolences to our brothers and sisters in the Jewish community following today’s horrific shooting. This sort of hateful act at a place where people go to find comfort, spirituality and peace is just unthinkable. We condemn this anti-semitic, hateful violence, and we stand with the Jewish community in this excruciating moment,” says NCCM Executive Director Ihsaan Gardee. Here in Canada, data from Statistics Canada shows the Jewish community continues to be most commonly targeted by hate crimes, closely followed by anti-Muslim hate crimes - a pattern mirrored in the United States. In recent years, the total number of hate crimes targeting religious minorities in Canada has continued to increase, signaling a disturbing normalization of xenophobia that is truly alarming. “Our communities know all too well how utterly devastating an attack on a place of worship is. Our hearts are broken alongside yours. But we recognize that heartbreak, and thoughts and prayers must be bolstered by firm action if we are to confront the hate that is sweeping across both Canada and the United States. With this in mind, we take this opportunity to reaffirm our long-standing commitment to working hand-in-hand with our Jewish neighbors to find tangible solutions to the intolerance that threatens us all - both across the border and here at home,” adds Gardee.